The Holy Apostle Andrew the First-Called was the first of the Apostles to follow Christ, and he afterwards brought to Christ his own brother the holy Apostle Peter (Jn. 1:35-42). The future apostle was from Bethsaida, and from the time of his youth he turned with all his soul to God. He did not enter into marriage, and together with his brother he worked as a fisherman. When upon Israel thundered the voice of the holy Prophet, Forerunner and Baptist of the Lord John, Saint Andrew became his closest disciple. Saint John the Baptist himself sent off to Christ his own two disciples, the future Apostles Andrew and John the Theologian, declaring Christ to be the Lamb of God. After the Descent of the Holy Spirit upon the apostles, Saint Andrew set off preaching the Word of God to the Eastern lands. He went through Asia Minor, Thrace, Macedonia, he reached along the River Danube, went along the coast of the Black Sea, through Crimea, the Black Sea Region and along the River Dniepr he climbed to the place, where now stands the city of Kiev. He stopped overnight on the hills of Kiev. Rising in the morning, he said to those disciples that were with him: “See ye these hills? Upon these hills will shine forth the beneficence of God, and there wilt be here a great city, and God shalt raise up many churches.” The apostle went up around the hills, blessed them and set up a cross. Having prayed, he went up even further along the Dniepr and reached a settlement of the Slavs, where Novgorod was built. From here the apostle went through the land of the Varangians towards Rome for preaching, and again he returned to Thrace, where in the small village of Byzantium – the future mighty Constantinople – he founded the Church of Christ. The name of the holy Apostle Andrew connects the mother – the Church of Constantinople – together with the daughter – the Russian Church. On his journeys the First-Called Apostle endured many sufferings and torments from pagans: they cast him out from their cities and they beat him. In Sinope they pelted him with stones, but remaining unharmed, the persevering disciple of Christ continued to preaching about the Saviour to people. Through the prayers of the apostle, the Lord worked miracles. From the labours of the holy Apostle Andrew there emerged Christian Churches, for which he established bishops and clergy. The final city to which the First-Called Apostle came, and where it was allotted him to accept a martyr’s end, was the city of Patra. The Lord manifest many a miracle through His disciple in Patra. The infirm were made whole, and the blind received their sight. Through the prayers of the apostle, the illustrious citizen Sosios recovered from serious illness; by the placing on of apostolic hands was healed Maximilla, wife of the governor of Patra, and his brother Stratokles. The miracles accomplished by the apostle and his fiery speech enlightened with the true faith almost all the citizens of the city of Patra. Few pagans remained at Patra, but among them was the governor of the city, Aegeatos. The Apostle Andrew repeatedly turned to him with the words of Good-News. But even the miracles of the apostle did not convince Aegeatos. The holy apostle with love and humility appealed to his soul, striving to reveal to him the Christian mystery of life eternal, through the wonderworking power of the Holy Cross of the Lord. The angry Aegeatos gave orders to crucify the apostle. The pagan thought to undo the preaching of Saint Andrew, if he were to give him over to death on the cross, which however the apostle glorified. 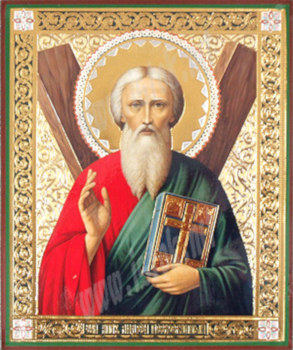 Saint Andrew the First-Called accepted the decision of the governor with joy and with prayer to the Lord he himself went willingly to the place of execution. In order to prolong the suffering of the saint, Aegeatos gave orders not to nail down the hands and feet of the saint, but to tie them to the cross. From up on the cross for two days the apostle taught the citizens who gathered about. The people, in listening to him, with all their souls pitied him and tried to take the holy apostle down from the cross. Fearing a riot of the people, Aegeatos gave orders to stop the execution. But the holy apostle began to pray that the Lord would grant him death on the cross. Just as the soldiers tried to take hold of the Apostle Andrew, they lost control of their hands. The crucified apostle, having given glory to God, uttered: “Lord Jesus Christ, receive Thou my spirit.” Then a blazing ray of Divine light illumined the cross and the martyr crucified upon it. When the shining ceased, the holy Apostle Andrew the First-Called had already given up his holy soul to the Lord (+ 62). Maximilla, wife of the governor, had the body of the Apostle taken down from the cross, and buried him with honour. A few centuries later, under the emperor Constantine the Great, the relics of the holy Apostle Andrew were solemnly transferred to Constantinople and placed in the church of the Holy Apostles alongside the relics of the holy Evangelist Luke and Apostle Paul’s disciple, the Disciple Timothy. Next Next post: Science of the Saints, 14-XII-2018 (1 Dec.), The Holy Prophet Nahum.